To date, Newark Central Ward Councilman Darrin Sharif's mayoral campaign has borne some resemblance to the 1984 Democratic Presidential Primary effort of astronaut John Glenn. In other words, it has given the very strong impression of trouble on the launch pad. But Sharif wants to change that evidently, and this coming weekend he has scheduled an anti-violence summit. Gov. Chris Christie is under fire from the same Latino constituency he courted so heavily during his re-election campaign. During his re-election campaign this year, Gov. Chris Christie of New Jersey made the Latino vote a priority, hiring a full-time director for Hispanic outreach, opening bilingual campaign offices and securing key Latino endorsements. He even spoke out in favor of legislation allowing in-state tuition for unauthorized immigrants, thrilling many Latino and immigrant voters. For his efforts, about half the Hispanic voters cast ballots for him, helping him win a landslide victory. Now, however, Mr. Christie is under fire from the very same constituency he courted so heavily. NEWARK — Newark Mayor Luis Quintana delivered a surprise Thanksgiving greeting to at least eight high-level City Hall staffers today: You’re fired. Four people with knowledge of the departures told The Star-Ledger that Quintana sent out pink slips to at least four department directors from former Mayor Cory Booker’s administration, as well as four high-ranking Booker staffers. ATLANTIC CITY - Elvis Costello might have sung "I Don't Want to Go to Chelsea" in 1978, but on Wednesday night at the 2013 New Jersey League of Municipalities conference, everyone wanted to go to the Chelsea. More than 1,400 wristbands, a new private event record, were handed out as the Garden State's political glitterati swarmed to the hotel on the Boardwalk. At an event co-hosted by Jersey City Mayor Steven Fulop, Newark councilman and mayoral candidate Anibal Ramos (pictured, above left), Roselle Mayor Jamel Holley and state Assemblyman Troy Singleton (D-7), party-goers tried to re-enact Atlantic City's 1950s Rat Pack-era glory. The evening began in high style at the Chelsea, with Fulop taking on the Sinatra role as his star continues to rise in statewide Democratic circles. For many, the evening would end in the morning at Harrah's in a haze of chlorine, vodka and vomit, with certain sights permanently seared onto their eyeballs. ATLANTIC CITY – At a poolside breakfast this morning in Harrah's, Essex County Executive Joe DiVincenzo said Barbara Buono's attacks against him prompted him to step up his campaign appearances with incumbent Republican Gov. Chris Christie. "When she started attacking me, it just made me want to campaign more - but I never said anything negative about her," the county executive said, referring to criticisms the Democratic nominee for governor made of her fellow party member, who backed Christie in the general election. DiVincenzo said he did the right thing, while acknowledging that he damaged his chances at a run for governor. ATLANTIC CITY – Newark mayoral candidate Ras Baraka knows that at the annual New Jersey League of Municipalities conference, good government seminars go on during the day. But the wheels of government get greased at night. So far Baraka has financially lagged behind the other major contenders in the Newark mayoral race to be decided in May 2014. As of this summer, Ramos, Newark's North Ward councilman, had raised approximately $373,000. Jeffries, a professor at Seton Hall University’s law school and attorney at the Gibbons law firm in Newark, has raised $365,000. Baraka had raised about $117,000. 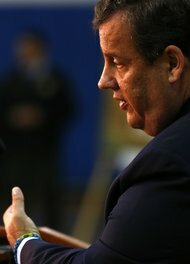 Despite being the second-wealthiest state in the nation, New Jersey has a higher real poverty rate than 35 other states, with about 1.35 million -- or one in seven -- residents living in poverty, according to the recent Supplemental Poverty Measure released by the U.S. Census Bureau. That’s 44 percent more than the 930,000 that are living under the official federal poverty level. The number of additional families falling into poverty using the more accurate measure is frightening: While the official poverty rate for poverty in New Jersey averaged 10.7 percent between 2010 and 2012, the supplemental rate was 15.5 percent. This is the second-largest difference of any of the 50 states (after California); nationally the difference was just one percentage point. The main reason for the high level of real poverty is New Jersey’s high cost of living, particularly for housing. The new census findings confirm other research from our colleagues at Legal Services of New Jersey and the United Way of Northwest New Jersey, which has consistently shown that real poverty in New Jersey is much higher than what is reported in the official poverty statistics. NEWARK — A spate of shootings in the state’s largest city left two people dead, at least two others injured and a Newark detective and two others hurt tonight after the officer was involved in a car crash en route to one of the homicide scenes, authorities said. The shootings marked Newark’s fifth and sixth homicides in the past seven days, and brought the city’s yearly homicide total to 92. The violence began around 6 p.m., when an unidentified 20-year-old man was shot and killed on Broome Street, according to Anthony Ambrose, chief of detectives for the Essex County Prosecutor’s Office. Roughly 90 minutes later, a second person was gunned down on North 6th Street between Sussex Avenue and Dickerson Street, Ambrose said. TRENTON - Assembly Speaker Sheila Y. Oliver this afternoon swore in Eliana Pintor Marin of Newark's Ironbound section to the New Jersey General Assembly. Pintor Marin represents the 29th District along with state Sen. M. Teresa Ruiz (D-29) and Assemblywoman L. Grace Spencer (D-29). Is Political Squabble Behind Essex County's Double-Digit Judicial Vacancies? Earlier this year, Gov. Chris Christie was having breakfast at McLoone’s Boathouse in West Orange with Essex County Executive Joseph DiVincenzo, the same place at which the Essex County Bar Association was having a meeting. With a record number of judicial vacancies in Essex County at the time, a member of the bar association asked the governor to stop by and comment on why the positions weren’t being filled. "The reason nothing’s happening, the reason we’re not appointing 12, 15 judges tomorrow in Essex County is because of Sen. Codey," Christie told bar association members, referring to Essex County Democrat Richard Codey. That was in April, when there were 15 vacancies. Since then, the problem has only gotten worse. The number of vacancies is now 21.